Destination Path Too Long. 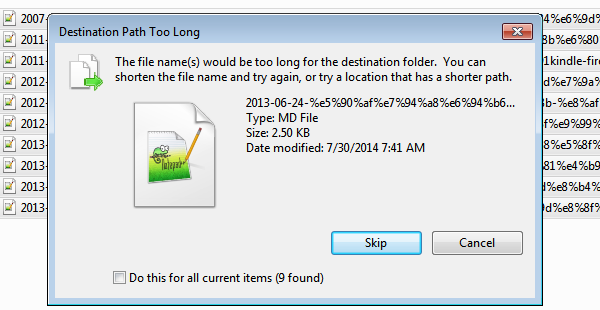 The file name(s) would be too long for the destination folder. There are several solutions to solve this issue either by installing special software or use complicated DOS commands which does not always work. I found a very useful way to delete these annoying files with long file names. Use a bootable USB stick with Ubuntu OS! Just insert the USB stick to the USB port of the computer which has problematic files, then boot the computer through USB. As soon as Ubuntu OS works, find the problematic files on the hard disk of the computer, delete them. That is fine. 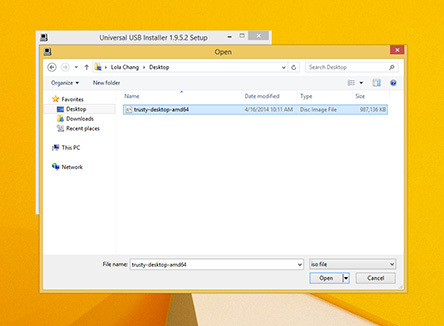 How to create a bootable USB stick on Windows? 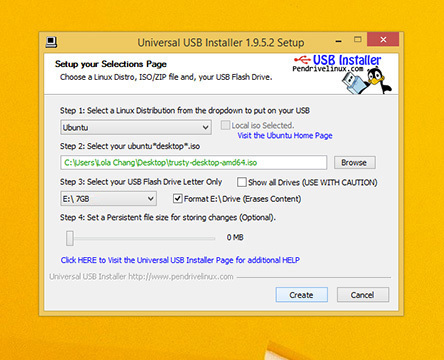 The easiest way to put Ubuntu onto your stick is to use the USB installer provided at www.pendrivelinux.com. You’ll need to download and install and follow the instructions. 1 Select ‘Ubuntu’ from the dropdown list. 2 Click ‘Browse’ and open the downloaded ISO file. 3 Choose the USB drive and click ‘Create’. For Ubuntu OS users, you can also use the default application Startup Disk Creator in Ubuntu to make a bootable USB stick. This entry was posted in Uncategorized and tagged Bootable USB stick, Linux, Ubuntu, Windows on August 6, 2014 by INK SAY. I also recommend to try Long Path Tool to delete files that have long name. delete, long path files by using this tool. I work in a company where I need to do lot of copying work and others, basically file handling and organising. This was a real mess for me untill I found GS RichCopy 360. My company bought its enterprise version because of its so many features like data compression before copying, multi threaded file transfer and its simplicity. Try it, hope it helps! Long path tool? Does that even work I mean it could work but for just one single problem why not get something which solves all! Look man, its fine to use it but it didn’t exactly worked for me. Why not get something of more use! Well, I used a software named GS RichCopy 360 which did very well in all aspects of copying files as well as providing speedy file transfers. Surely recommend this one. This an evil error. Trust me when I see this error I loose my mind. I work in a company where I need to do lot of copying work and others, basically file handling and organising. This was a real mess for me untill I found GS RichCopy 360. My company bought its enterprise version because of its so many features like data compression before copying, multi threaded file transfer and its simplicity. Try it, hope it helps!